The AmeriGlide Jazzy Sport is the pinnacle of modern power wheelchair design and value, that comes with a retail price that is, on average, $2000 less than similar items from our competitors! You can enjoy the same features and functionality as other electric wheelchairs on the market for only a fraction of the price! The Sport is built with a highly durable double-layer powder-coated frame, and features in-line motors and front and rear casters wheels to ensure that every trip you take on your Jazzy Sport is smooth, stable, and safe. 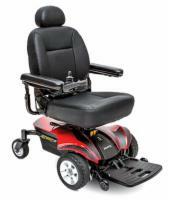 This value-priced power wheelchair is perfect for use in both indoor and outdoor settings.